July 2018 Community Relations: Special Olympics | Cox Automotive Inc.
Cox Automotive team members and their families come together quickly, unabashedly, and resolutely to make a difference in the community again and again. It’s the Cox Automotive way. 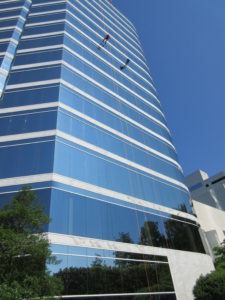 Bystanders outside a 22-story office tower in Atlanta, Georgia were captivated watching Cox Automotive team members and other participants rappel down the building on Saturday, May 5, 2018. But this outing was more than an adrenaline junkie adventure. It was the annual Over the Edge event that raised more than $100,000 for Special Olympics Georgia. In exchange for raising money, participants earned the once-in-a-lifetime opportunity to scale the building, demonstrating the Special Olympics ideals of being fearless and facing new challenges head-on. Climbing professionals and pre-event training made for a smooth and exhilarating occasion. Fortunately, Cox Automotive’s commitment to Special Olympics Georgia isn’t limited to daredevils. In fact, its parent company—Cox Enterprises—has been a proud sponsor of year-round activities for 14 years. The company meets with the non-profit’s staff once a year to help evaluate their needs. Cox Automotive team members and their families regularly volunteer at local competitions. The Over The Edge event was merely the warm-up to the state Summer Games held at Emory University May 18-20, 2018. Nearly 3,000 athletes arrived on campus to compete in Aquatics, Athletics, Flag Football, Gymnastics, Long Distance Running and Walking, Table Tennis, Tennis, and Volleyball. While the games are free and open to the public, they couldn’t happen without hundreds of volunteers. Cox Automotive team members were assigned to the swimming venue. From serving as timers for heats, as escorts directing athletes to their lanes or as behind-the-scenes handlers, to assisting at the awards ceremony to manning the cheering lines, volunteers worked closely with Special Olympics staff and athletes for an unforgettable competition. 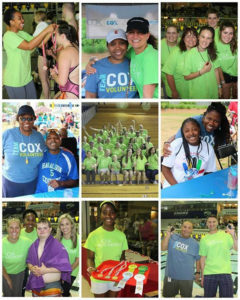 Some Cox Automotive employees were veteran Special Olympics volunteers while others were new to the games. Although their experience varied, the only must-have was enthusiasm. Shawan Allen, Cox Automotive’s Community Relations Coordinator, says employees are passionate about Special Olympics. While the statewide Winter Games don’t occur until January 2019, you can bet that Cox Automotive team members will be there. And also at the smaller, local competitions occurring over the next several months. From every job title within the company, from every age from 8 to 80+, Cox Automotive team members and their families come together quickly, unabashedly, and resolutely to make a difference in the community again and again. It’s the Cox Automotive way.